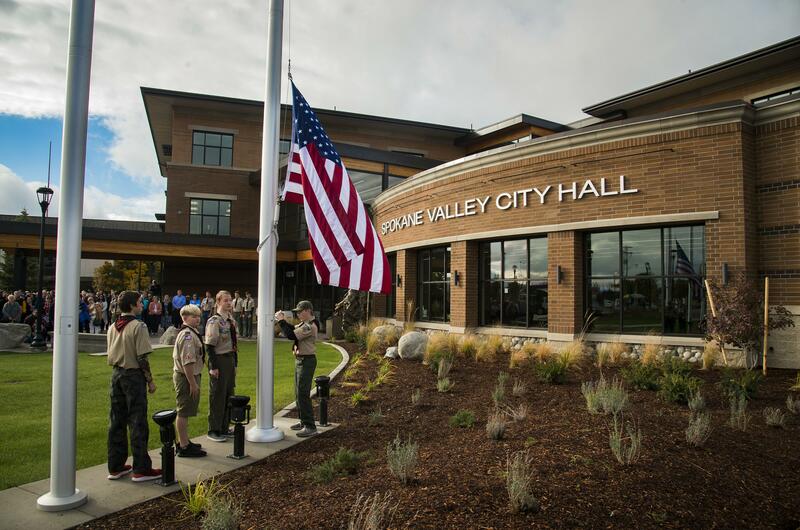 Proposed regulations would bar commercial, political and religious events at Spokane Valley’s new City Hall and grounds. The proposal would put those rules in writing. Spokane Valley Councilman Ben Wick asked if rallies or protests would be considered a political event. Driskell said he will consider clarifying language in the proposed ordinance to reflect campaign-related events could be prohibited, rather than protests. “We have to be careful that we aren’t infringing on people’s First Amendment rights because I think there’s some limited things, at the very least, that people can do on a City Hall site that we have to be careful about, and I know the council has obviously been very concerned about people’s First Amendment rights and protecting those,” he said. Spokane Valley Councilman Arne Woodard asked Driskell if there’s an option that would limit protests to occur before or during council meetings. Valley resident Leilani Delong organized two rallies last year outside City Hall with the Valley Indivisible Progressives, protesting Wick’s removal from the Spokane Regional Transportation Council and encouraging council members to denounce racism. She questioned the proposed ordinance, stating it defeats the purpose of building the new City Hall, which, she thought, was to be more accessible to constituents. Delong said placing a time limit on rallies isn’t warranted, noting the two rallies were 25 minutes each and held before City Council meetings. “I think that’s something to consider, too, and our right to free speech and assembly,” she said. “It was their electorate speaking to them. Don’t they want to hear from all their constituents? “Our rallies are for them to listen to us so that they know we have an opinion, certainly not to get someone elected,” she added. Annie Gannon, Spokane Valley city spokeswoman, later said a revised version of the ordinance is not expected to include time limits on rallies. Spokane Valley Councilwoman Brandi Peetz said she would like to look at options to accommodate groups at Balfour Park across the street from City Hall. Balfour Park hosts events such as the El Katif Shrine Circus. Events closely related to city functions, like the annual Christmas tree lighting ceremony outside City Hall, or those that aren’t classified as political, religious or commercial, could be allowed on a case-by-case basis, upon approval by the city manager. Spokane Valley City Manager Mark Calhoun said the city intends to update the Balfour Park master plan this year – which was created in 2013 – so it can be eligible for park improvement grants. Delong said the rallies would be less meaningful if held at Balfour Park. Spokane Valley City Councilwoman Linda Thompson said City Hall belongs to the people. Spokane Valley Parks Director Mike Stone said the proposed ordinance is geared toward larger, special events such as car shows. Stone said the city is reaching a point where park regulations – created more than 10 years ago – need to be updated. “We are being hit up very hard by a wide variety of groups and we are trying to accommodate as many as we can and yet be good stewards to the resources we’re supposed to manage,” he said. The Spokane Valley City Council is expected to discuss the proposed ordinance again at a Feb. 26 meeting.